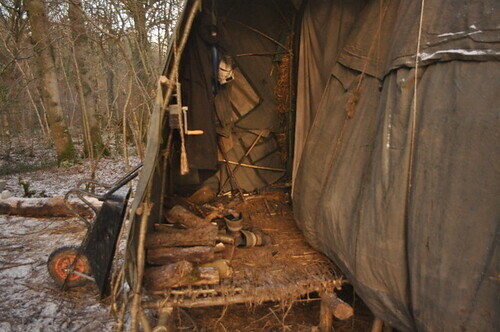 Our first big challenge, which had to be done before the cold really kicked in, was the main house. This needed to be temporary, but strong enough to withstand anything the unknown winter ahead could throw our way. Thankfully, we were between hillsides and treelines, so the wind’s worst lashes were avoided. We had various plans, and they were all adapted in situ, for pragmatism overwhelmed all. But stage by stage, we got there. 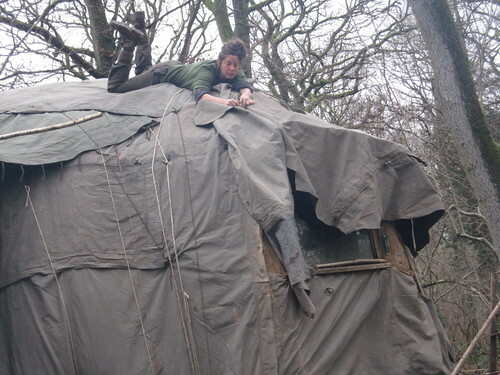 The hazel dome on stilts took 1 month to create, with the four of us working full time (alongside all the other necessary doings of woodland life…). 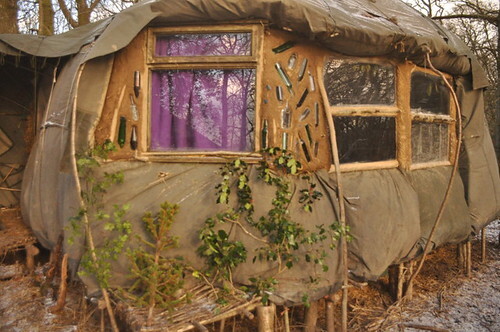 While it was being built, we all lived either under thin plastic sheets, or in the A Frame. Neither option was off the floor, so we became pretty savvy about the nocturnal habits of the wood mice (apodemus sylvaticus). 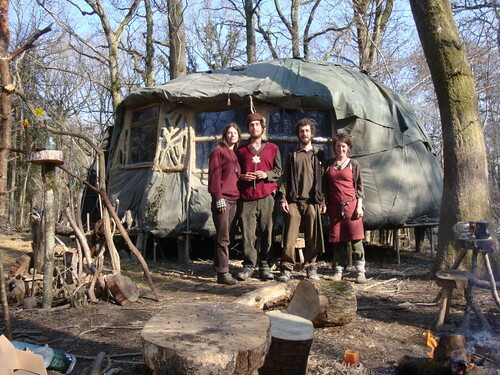 A platform was the first adaptation we made to our general hazel dome plan, as the woods were damp, and the millions of wood-mice wanted to sharpen their ever-growing teeth on anything we valued. But a platform needed to flat, and we had no access to machine-made plywood. So we had to improvise, with hazel hurdles. This was a learning process all of its own, which we discuss here. 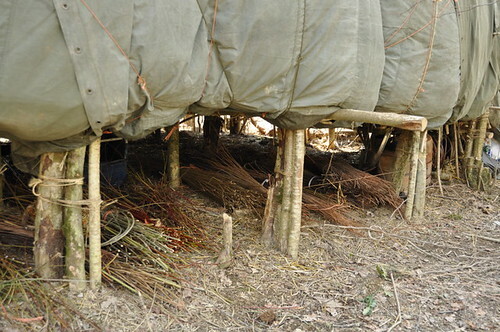 The next step was in creating the upright structure, to hold the canvas and straw insulation off our heads. 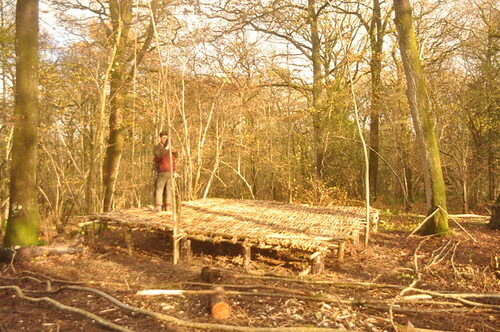 We then needed to weave the structure with long hazel rods, cut and trimmed with the billhook. This made the dome structure strong enough to support the canvas, and our weight. 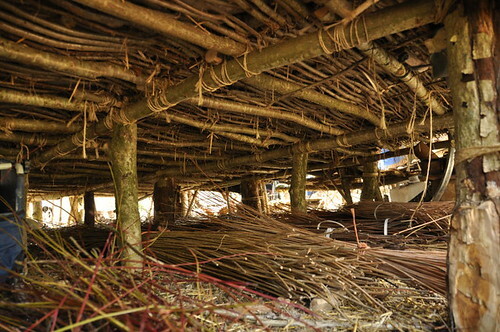 It is amazing how a single piece of flexible hazel wood can be woven with others, to create something many times stronger. Weaving seems to be a core human technology, for baskets, hurdles, fabric and clothing, and even computer information is woven (010101101100). A hurdle foyer then provided the transition space between outside and inside, somewhere to remove shoes (which were never worn indoors). 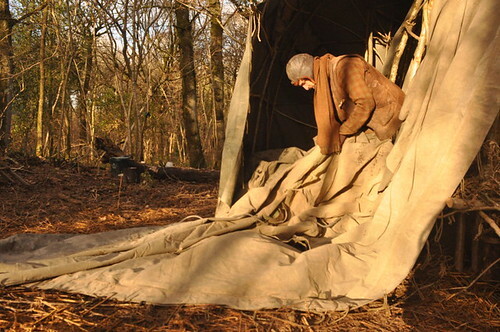 Straw was then stuffed, by the slab, into the space between the canvas and the interior blanket layer. This kept the heat in, and made the whole thing look like a puffa jacket. 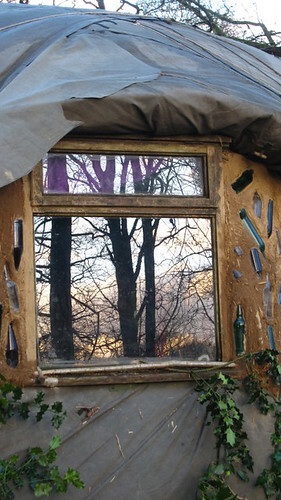 The next step was in fixing the windows, which Rose decided would be best done with cob. The perspex window panes were donated by a kind lady, and they were framed with hazel sticks, gouged out and pegged with hazel to hold all together. The gaps between these windows, which were bound onto the main house hazel frame, were decided to be best plugged around with cob. Heavy clay subsoil, dug from the compost loo pit, was mixed with straw and rainwater in a tin tub borrowed for the task. The straw supplies the lengthy fibres which bind the clay together, and stop lumps dropping off. We mixed in as much straw as we could, Rose’s hands almost falling off with this job, but a surprisingly small amount of straw could be persuaded to mix in. 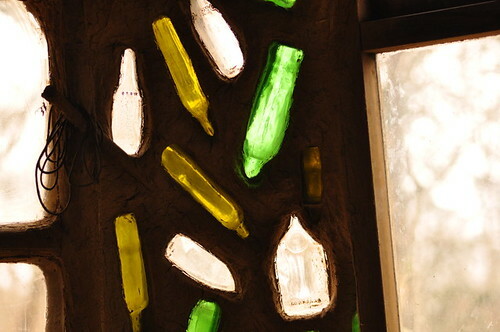 Old bottles were added to the mix, to allow light transference, and a splash of good morning colour. This was all done, and an overhang designed to protect the cob from the worst of the driving rains – a good hat and boots, they say, ensures cob will endure. The old wood burner we installed in a corner of the house helped greatly in drying the cob out thoroughly, and likewise in keeping us alive during the chillier snaps. It would have been cleverer to cob in the summer months, when there is no danger of freezing. But no such option existed. Some sand in the mix would also likely have helped, as the clay has little sand in it. But, with the materials at hand, the job was bodged sufficiently well, and the windows let in light, while the cob kept out draughts. 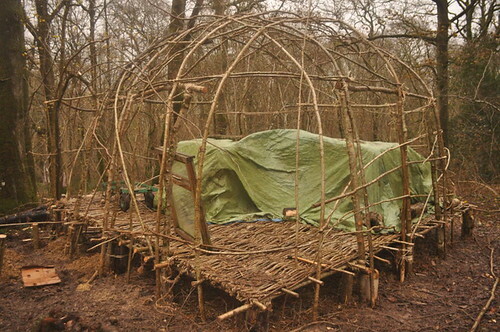 This technology worked very well, and it is no surprise that as a temporary shelter, cob and hazel has such a solid ancient reputation – wattle and daub, they call it, and in places it has lasted many hundreds of years. Is it still standing? 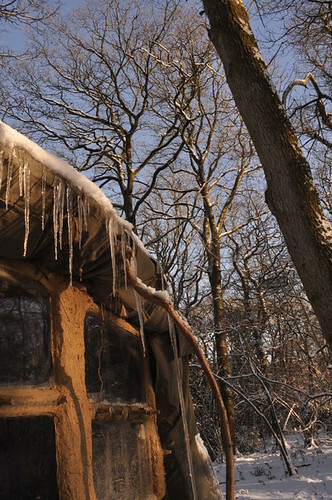 Could you use a different type of wood – still flexible enough yet strong enough to last longer and bear the weight of heavy snow? Thank you for these great little vids – especially the one that showed the gradual construction of the house – absolutely fascinating to see it from the ground-up….it’s really beautiful too.What happens when you leave…will it stay there?